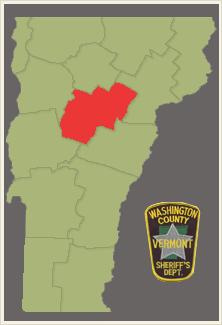 In 1810 Jefferson County, Vermont was established. In 1814 the name was changed to Washington County, renaming the County after George Washington. Washington County is approximately 695 square miles and is one of two Counties’ (Washington and Lamoille) that are not bordered by another State or Canada. In 1820 there were 14,113 people in living in Washington County. The 2010 census found 59,534 people now to be living in the County. Montpelier is the Shire Town and is also the State Capital. The current State House is actual the 3rd, as the first two burned down. Washington County’s first jail was built into the dwelling erected by Montpelier’s founder, Jacob Davis, shortly after his arrival as the first settler in 1787. That building was given to the County by his son Thomas Davis and was rebuilt in granite in 1832. Another jail was built in what is now known as Jail House common, at 24 Elm Street, Montpelier, Vt. Completed in 1900, a new Jail and Sheriff’s House was built at it’s currently location, 10 Elm Street, Montpelier, Vt. The Sheriff’s House is now the Sheriff’s Office and the Jail has been remodeled into Probate Court. The Sheriff’s Office currently has 10 full time Deputies, two Office Staff members, the Sheriff and many part time Deputies. The Office preforms its statutory functions of transporting prisoners, mental health workers and juveniles as well as serving civil process. The Office is also responsible for security at Criminal, Family, and the Civil Divisions in Washington County, as well as Supreme Court. The Office contracts with 10 towns with in the County for Motor Vehicle Patrol as well as preforming a multitude of security and traffic functions throughout the County.